The local Humane Society contacted me to ask whether I could make some ADOPT ME vests for their adoptable dogs. I do sew and donate dog bandanas, cage mats for the cats and hammocks for the kitties but sewing these dog ADOPT ME vests was a first for me. 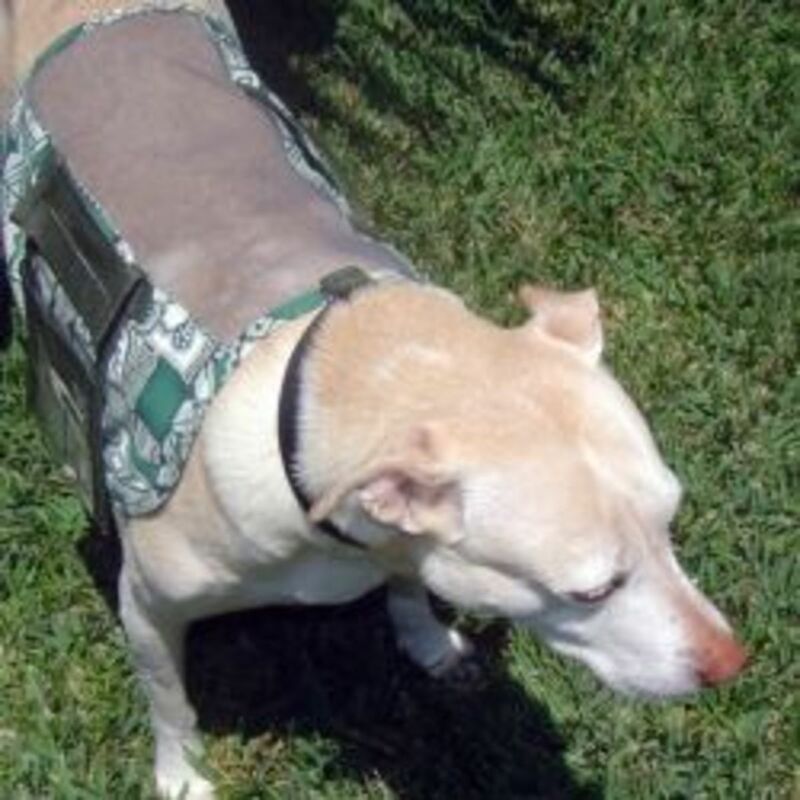 I researched online to see what type of dog adoption vests were available, knowing I wanted to make a donation dog vest that was comfortable, affordable and easy to construct. The Animal Behavior Department at the shelter also gave me a wish list of the features they would like. After tweaking, the original adoption dog vest pictured is the result. Dog Adopt Me Vests - Easy to Sew! My PDF pattern requires basic sewing skills and can be sewn by beginning sewists to experts. Anyone who sews this ADOPT ME vest will have the opportunity to work with several different materials in the process. I've been sewing almost 50 years and this was a truly fun, rewarding project for me. These ADOPT ME vests can be sewn rather quickly in assembly-line fashion. It would be the perfect Saturday project for groups wanting to support their local shelters. Scouts, Animal Advocacy volunteers, etc.... Anyone interested in helping animals would be a great candidate for this dog vest pattern. Don't Sew a Dog Vest Without This :) - I use mine constantly! Cardboard Pattern Sewing Cutting Board-36"X60"
This cardboard cutting grid was a lifesaver and a real timesaver when making the adoption vests for dogs. I use mine for all my sewing projects, but it was indispensable in the making of these vests. Cutting the clear vinyl, the screen and the webbing was so much quicker and easier using the 1" square grids on this board. and, of course, I Need Your Help to get the word out about these ADOPT ME vests also. The more people aware, the more chances for dogs to find their forever homes. What is so special about ADOPT ME vests? Awareness and Monies Raised Helps the Animals! The dog ADOPT ME vests can be used by pet fostering families. The fostered dog wears the vest as they are being walked in public to make people aware he or she is available for adoption. Our sweet rescue dog, Lana, is pictured wearing one of the completed ADOPT ME dog vests. Polypro webbing (found further down the page) and the Dee rings below are essential in the making of these dog adoption vests. What's so special about the design of THIS dog adoption vest? It's easy to sew with three main pattern pieces. The pattern is very affordable and will remain low so more sewists, more shelters AND more dogs can benefit from their use. It's lightweight. The large vest with two donation pockets weighs less than 6 ounces. It's designed to be used with either/or both a dog collar and walking harness. It's cool and comfortable. My pattern suggests a cotton or a cotton/poly blend fabric for the side panels. The center mesh screened panel down the back is literally light as air. Easy to care for. Machine wash cold and low air or line dry. This is the exact polypropolene webbing I use to make the vests. It's strong, but sews beautifully on any machine. It's also available from this manufacturer in several other colors, blue, red, green, etc. There are so many ways to help animals in shelters. You might be surprised to know what is on a particular shelter's Wish List. (They all have one.) Here's the wish list for the Hawaiian Humane Society. Perhaps if you're making a group effort to sew ADOPT ME vests, you may want to add in making some colorful, cotton bandanas that slip over the dog's collar safely. With teamwork, everyone can pitch in and learn something new while feeling great about helping animals. Above all, I wish for all animals to find loving, forever homes. Whether someone buys this dog vest pattern and makes ADOPT ME vests to sell or to donate, in the end it will be the animals who benefit. If people can't buy a pattern, I hope they will share this article. Thanking you kindly. Thank you! You Made All The Difference In My World! 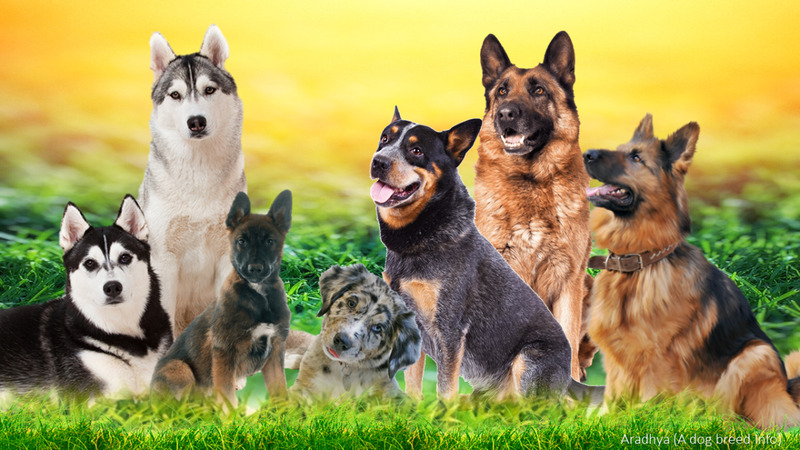 Will you be making a dog adoption vest, or - maybe you've contacted your local Humane Society or Animal Shelter to see what's on their Wish List? I am looking for items that would greatly be appreciated in helping the rescue I foster for in getting our puppies and dogs noticed as needing to be adopted. Would you be willing to donate??? Good for you! Anything to help shelter dogs find their forever home is a wonderful idea. The dogs look so cute in them too. This is a great lens! We have a rescue dog, and any other dog I ever get will be a rescue. I also do a lot of events where they do animal adoptions and use vests similar to these! I bought the pattern to make some for a couple of local animal shelters. Oh this is such a good idea! I'm sure you are helping pets find homes with these. 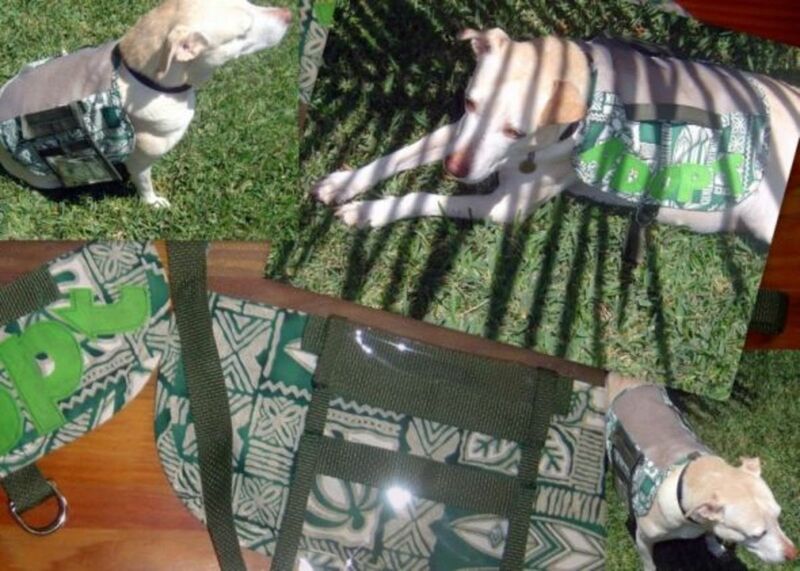 I'd say the Hawaiian Humane Society knew just who to contact for this ADOPT ME vest project, I've never heard of this program before and what a great way to raise awareness. I had never heard the term "sewists" before, cool...and so are you my dear! Well done! These vests are adorable and you are a hero to these animals. Blessed. You are a real champion for the animals. Good work and good idea to share it here. These "adopt me" vests are so cute! Such a neat idea... for raising awareness. The place where I got one of my dogs - SPCA of Wake County is on Facebook....sometimes they put up a notice about a critical need. A month or so ago they had emergency need for canned cat food pate....I ordered from Amazon and sent it and they got a ton of response. Then the SPCA put up "before and after" pictures of the pantry cabinets on facebook...before - one or two cans...after - packed full of cat pate! It was very cool. Hey - this is a great idea.....I think this should be lense of the day - I do not know how to submit it though! I used to foster, before my Mom came to live with me. After Mom was here, I couldn't risk having strange dogs around so we just muddled on with our 5 rescues. But, when I fostered, I made these really nice business cards for the foster dog detailing their features, the type of home I wanted for them (children vs. no children, etc). I handed out a card to anyone and everyone who approached us on one of the frequent visits to PetSmart (great place to take a foster dog, btw). The cards were a huge hit. Maybe your humane society could do something like that too. Excellent article, Pam. Very cool idea. I like it. Once Disney released the 101 Dalmatian movie, a year later the SPCA and other animal rescues were swamped with young Dals. At one time we had adopted five Dals, two being deaf and about to be put to sleep because they were deaf. Now it's labs and lab mixes. We currently have a Dal and two lab mixes (who are wrestling on my bed at the moment). I like your dog adoption vests, quite a good idea. 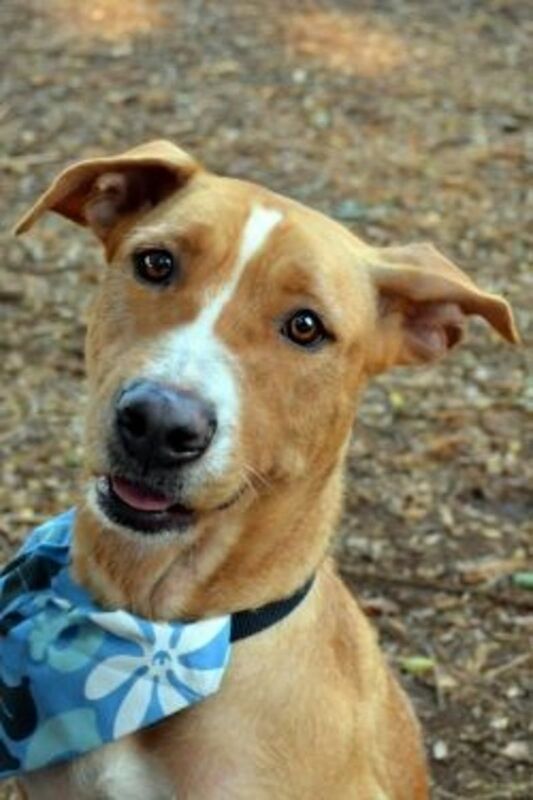 Awe love the Hawaii Humane Society and love his blue bandana in above photo! Back to grant my very first angel blessing to this worthy lens! Angel kisses to Lana, too! I need to get out my sewing machine and make good use of the pattern I got from you! It is a great idea, I will see if our rescue group needs one. We adopted our weimaraner after falling in love with him when we fostered him. Love your idea and the caring time you have given this project. It is certainly something that our community ASPC would benefit. Here is some Angel Dust to sprinkle around all those beautiful animals awaiting adoption. 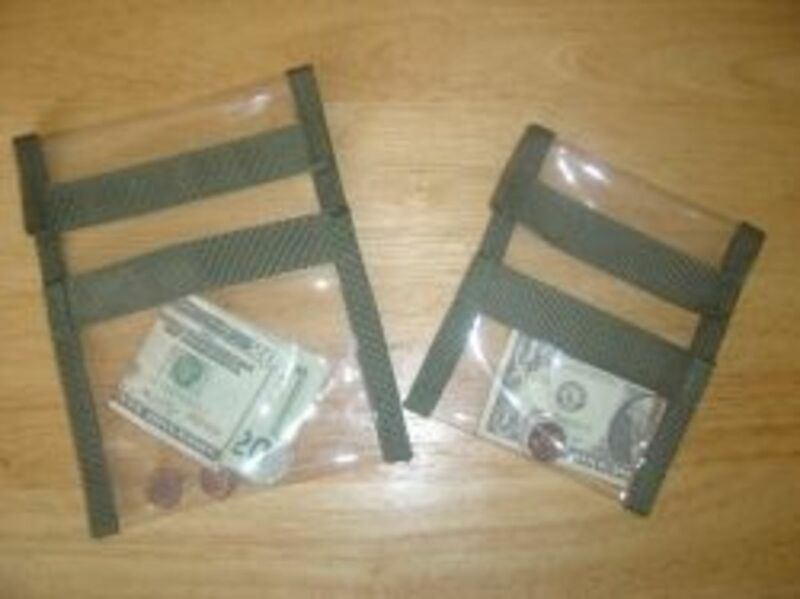 This is a fantastic idea... Thankyou for taking the time and effort to design such a great product. I hope it 'catches on' all over the world - we could do with efforts like this in my home town, where the local council has a 'hate complex' against the residents rescuing animals (dogs, cats, companion animals generally). Happy Fourth of July! This is such a great idea and wonderful project. Bless you for your efforts to help these loving creatures find their forever homes. LOVE this lens and all you do to help the animals find comfort, and hopefully, their forever homes. I have put a link to your Etsy pattern page on my local Humane Society's FB page. Hopefully they allow outside links like that and they keep it up, and even better, forward the link to other area shelters. What a marvelous idea! I had seen some rather expensive looking ones, but this looks even better than those! As a quilter, I sew quite a bit and have lots of fabric that would work perfect! You are a talented and big-hearted woman, indeed! A friend of mine fosters dogs. Every Saturday, the dogs spend the day in a local pet store, hoping to be adopted. 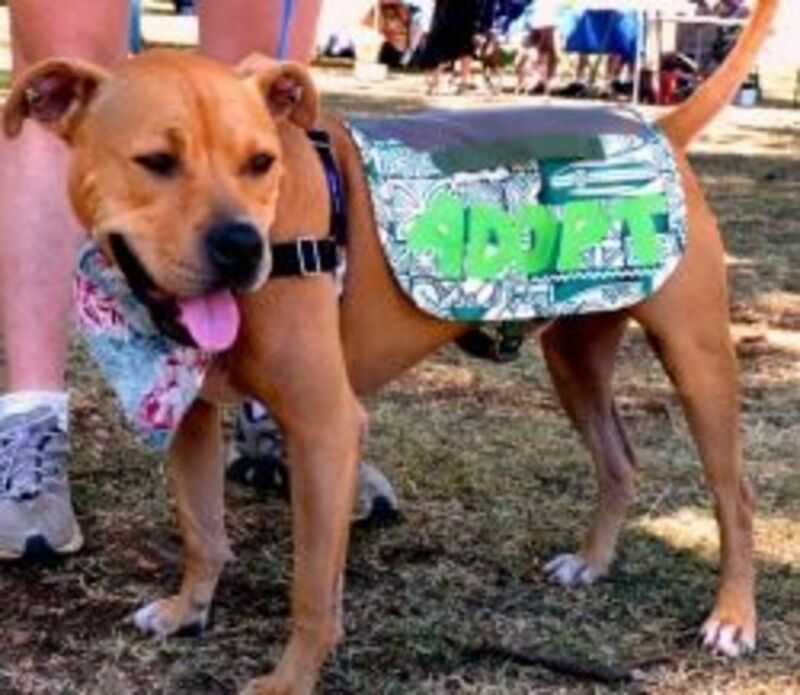 Your dog adoption vests are a great idea! 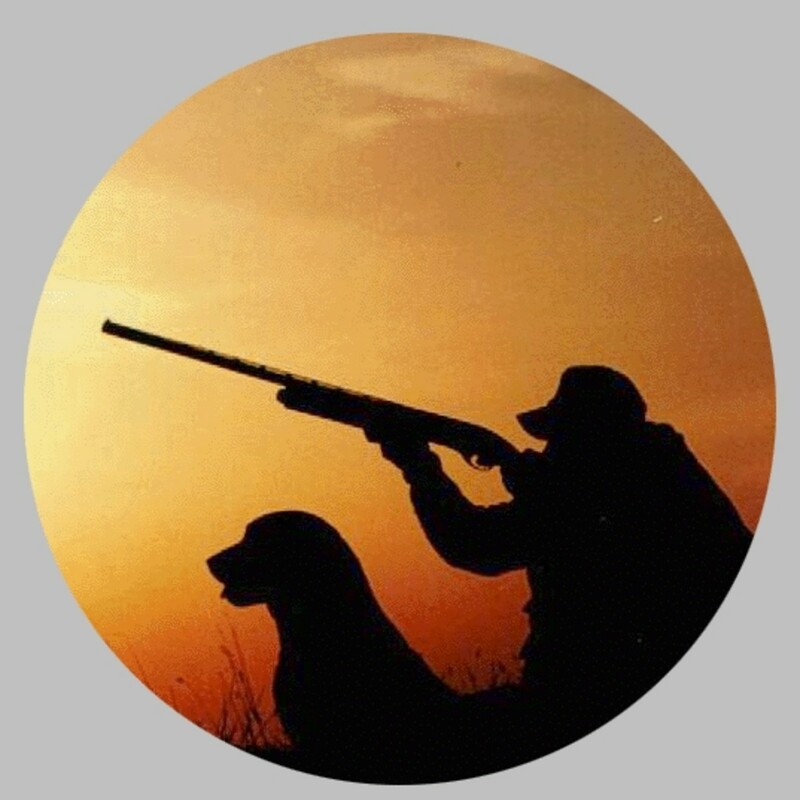 Great lens for a great cause, Humane Society of the United States! I couldn't sew to save my life, so I'm very impressed not only with your talent, but with your passion for homeless pets! Awww, such a cute idea! Thumbs up. I volunteer for a dog rescue, they may be interested in your adopt me vest pattern - very useful and creative idea! 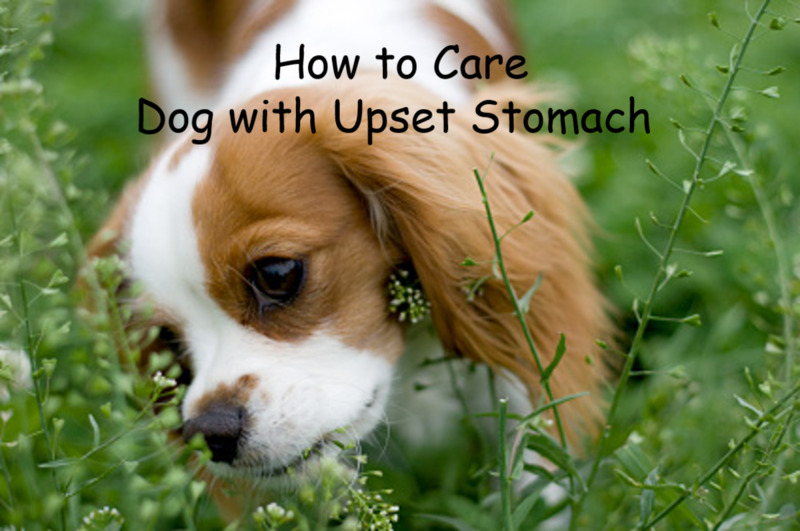 Linking this to my golden retriever rescue usa lens. Best to you! These look great, Pam! You've very talented to make this pattern! This is a really nice idea and a lovely lens to go with it. It's so sad to see nice dogs that are in need of a good home where they can have the love and attention that they need. Excellent job.